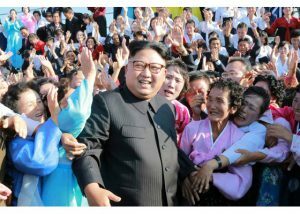 Kim Jong Un greets teachers working during a photo-op at Ku’msusan Palace of the Sun in Pyongyang (Photo: Rodong Sinmun). DPRK state media reported on September 12 (Tuesday) that Kim Jong Un (Kim Cho’ng-u’n) attended a meeting and photo-op with school teachers working in geographically remote locales and near forward-deployed military units. Also in attendance were Workers’ Party of Korea Vice Chairman for Science and Education and Supreme People’s Assembly [SPA] Chairman Choe Thae Bok [Ch’oe T’ae-pok] and Education Commission Chairman Kim Sung Du [Kim Su’ng-du], among other senior party and state education officials. 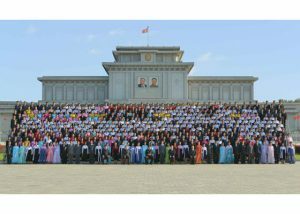 Commemorative photograph of Kim Jong Un with teachers working in geographically remote locales and near 1st echelon military units (Photo: Rodong Sinmun). 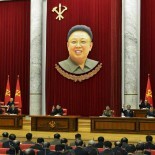 After his remarks, Kim Jong Un posed for commemorative photos. 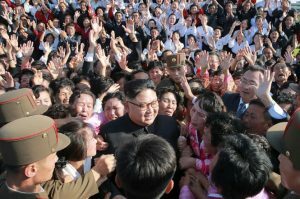 This article was written on 14 Sep 2017, and is filled under basic party organizations, Central Committee, Central Military Committee, Choe Tae Bok, DPRK Cabinet, DPRK education system, Education Commission, Education Section (PAD), Events Management Section, Executive Policy Bureau, General Affairs, Guard Command, ideological slogans, Kim Chong-un inspections, Kim Family, Kim Jong Un Visits, Kim Jong-un, Kim Sung Du, KJI Personal Secretariat, Korean People's Army (KPA), Korean Workers' Party (KWP), KPA basic party organizations, KPA East Command Zone, KPA General Political Bureau, KPA General Political Department, KPA General Staff, KPA I Army Corps, KPA II Army Corps, kpa IV army corps, KPA supernumerary organizations, KPA V Army Corps, KPA West Sea Command, kpif, KWP Science and Education Department, Local Party Affairs, local people's committees, military security command [msc], Ministry of Common Education, Ministry of Culture, ministry of people's security, Ministry of State Security, Ministry of the People's Armed Forces (MPAF), MPAF GPB, NLL, Organization and Guidance Department, party cells, Party elders, party life, Party Life Guidance, Political Bureau, population control, Propaganda and Agitation Department, Provincial Party Committees, Provinicial People's Committee, Publication Guidance Bureau, Publications, Pyongyang Defense Command, State Affairs Commission, State Security Department, Supreme People's Assembly, theoretical works.